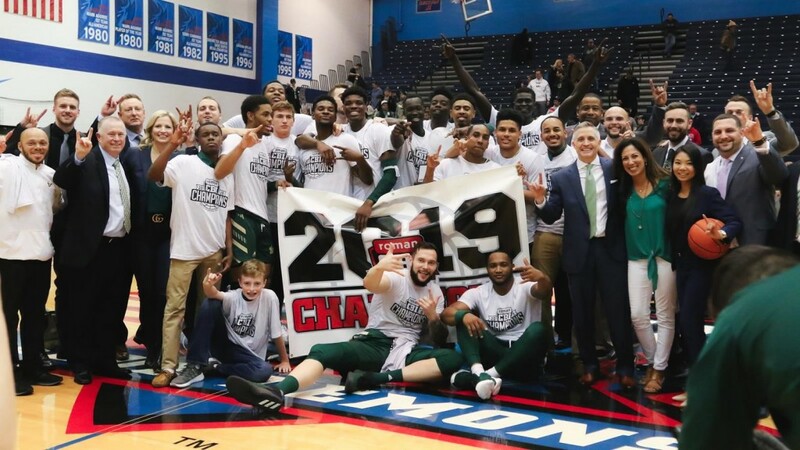 For the first time in almost 30 years, USF men’s basketball can say it is a champion. The Bulls (24-14) cut down the nets after a 77-65 victory against DePaul (19-17) in Game 3 of the College Basketball Invitational (CBI) final Friday night in Chicago. The CBI championship is USF’s first postseason tournament championship since the Bulls won the Sun Belt Conference Tournament in 1990. On a more contemporary note, it is the punctuation mark in a turnaround season — from winners of only 10 games last season to a postseason championship. "Talk about the grit and the toughness of our team and our program, and what we want to build on," coach Brian Gregory said in a statement. "It's a great stepping stone for where we want to get to." The biggest difference in Game 3 were each team’s top scorers. DePaul’s Max Strus, who scored 20 in the first half Wednesday, was effectively shut down — Strus scored 16 total points Friday. Meanwhile, David Collins, who was held without a field goal until there were less than five minutes left in regulation Wednesday, led USF with 19 points. Collins almost collected a double-double, finishing with eight rebounds. Collins was named CBI MVP, scoring 54 points and recording 17 assists and 14 rebounds in the final. Collins also made the game-winning shot in Game 1 at the Yuengling Center on Monday. Things started out great out of the gate for the Bulls. USF led by as many as 17 points. Justin Brown led USF with 10 points, going 2-of-3 from 3-point range. But things didn’t stay that easy, at least for a period of time. DePaul ended the half on a 14-2 run, bringing the USF lead to two at the break. In the last five minutes of the half, USF was called for six fouls which led to nine of DePaul’s final 12 points of the half being scored from the free-throw line. DePaul got as close as one within the first three minutes of the second half. That would be as close as the Blue Demons got. From that point on, USF outscored 36-25, aided by a 6-0 run immediately after the lead was cut to one. Ultimately, despite the scare, the Bulls led for all but 39 seconds — when the game was still scoreless — in the deciding game of the CBI final. USF ended its season not only as CBI champions, but with the most wins in program history (24) and, with a 14-win improvement on the 2017-18 season, the biggest win improvement in Division I. "When you've got Laquincy [Rideau], and you've got David Collins, and you've got Alexis Yetna, you can win a lot of games," Gregory said. "We're going to get even better, I promise you." Editor's note: This story has been updated from its original version to include quotes from coach Brian Gregory, a new photograph and add USF's win total to the story.